We offer 23 comfortable rooms with 1 king, 1 queen or 2 queens beds. 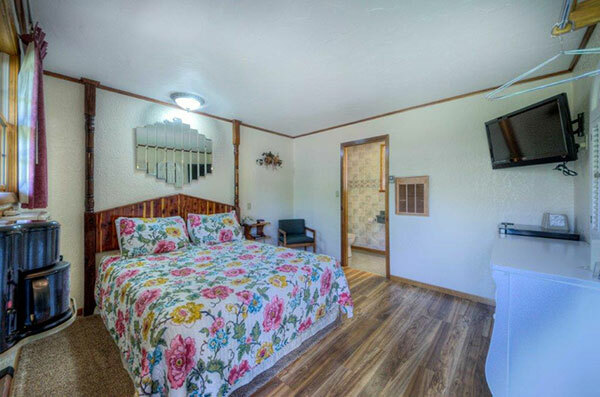 All of our rooms are non-smoking and feature cable, private baths and complementary wireless internet. These suites feature premier second floor views of the picturesque courtyard. Rooms are beautifully appointed with an eclectic collection of Americana decor, and feature comfortable beds, sitting area, mini fridge, and private bath. Perfect for a gathering of friends or family for a relaxing and fun-filled stay. Featuring ground access to the picturesque courtyard, these rooms are appointed with an eclectic collection of Americana decor, comfortable beds, sitting area, mini fridge, and private bath. Suites feature 2 queen beds, reclining leather sofa and loveseat, electric fireplace, beautiful chandelier and nice large bathroom. We look forward to your visit! Here's some information you may want to prepare for your trip. The Inn features a playground and several comfortable outdoor common areas. In the neighborly spirit of the Black Hills, guests are encouraged to use these gathering areas to socialize at their leisure between the hours of 9AM and 9PM. We ask that noise be kept at a respectful level in consideration of guests who may be resting. The front desk is open daily from 7 AM - 9 PM. If you are planning to arrive after 6 PM please contact the property in advance using the information on the booking confirmation. A credit card is required at check-in to cover incidental charges. Property amenities are subject to change. Hotel photos representative only. Children under the age of 18 must be accompanied by an adult. If additional people check in contradicting what the reservation states there will be a $10.00 per person additional charge. Check in must be done by 6:00pm MT on date of arrival. If arriving after 6:00pm please call 1-800-841-0127 to confirm arrival time. Thank you. For holidays and special events, please contact us at 1-800-841-0127. We will do our very best to accommodate you ! Cancellations made before 3:00pm MT, 3 days or more prior to arrival date, will be charged $25 plus a 5% handling fee. Cancellations made after 3:00pm MT, within 3 days of the arrival date, are nonrefundable. Holiday and special event reservations require a 14 day cancellation policy. Reservations cancelled before 3:00pm MT 14 days or more prior to arrival date will be charged $25 plus a 5% handling fee. Reservations cancelled after 3:00pm MT within 14 days of arrival date are nonrefundable. Feel free to contact us with any questions you have or to make a reservation. A legendary gold rush town nestled in the Black Hills of South Dakota, Deadwood is known for its outlaw history, its vibrant casino industry, its friendly community and beautiful natural surroundings. There are so many great reasons to visit Deadwood!